Brown rice is the whole rice kernel minus the outer husk. To produce white rice, the next layers underneath the husk (the bran layer and the germ) are removed, leaving mostly the starchy endosperm. Several vitamins and dietary minerals are lost in this removal and the subsequent polishing process. Some of these missing nutrients, such as vitamin B1, vitamin B3, and iron are sometimes added back into the white rice making it 'enriched', as food suppliers in the US are required to do by the Food and Drug Administration. One mineral not added back into white rice is magnesium; one cup (195 g) of cooked long grain brown rice contains 84 mg of magnesium while one cup of white rice contains 19 mg. Brown rice is also rich in the vitamins B5 and B6, and the minerals manganese, phosphorus and zinc. When the bran layer is removed to make white rice, the oil in the bran is also removed. Rice bran oil may help lower LDL cholesterol. Among other key sources of nutrition lost are small amounts of fatty acids and fibre. All kinds of rice can be brown or white, including long grain, short grain, jasmine, basmati, sweet rice, etc. 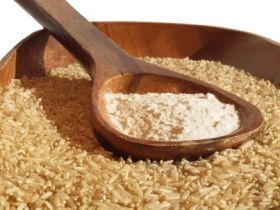 We use mostly organic long-grain brown rice, organic jasmine brown rice and organic sweet brown rice. We mill our rice flour from the long-grain brown rice, which is also good as a normal cooking rice. The jasmine rice is quick-cooking and aromatic when cooked. The sweet (sticky) rice is delicious cooked with soy milk and dried fruit making a kind of hot breakfast cereal. Simply cook in the normal way (with two parts water), then add plenty of soy milk, dried fruit, diced apples and a dash of honey, coconut and orange rind and cook gently until the rice is soft and creamy. It may be reheated in a casserole dish in the oven the next day. Sprinkle sliced almonds on the top, yum! We are familiar with cooked or steamed brown rice with vegetables as a main dish, however brown rice flour is also a wonderful and versatile ingredient. It is great for biscuits (see our Rice Cookies, Rice Carob Biscuits and Rice Cantucci Biscuits) and also works very well in gluten-free pastry. It can be used on its own or mixed in equal parts with buckwheat flour with good results. Brown rice flour makes great waffles and is a key ingredient in gluten-free bread.